These Acrylic Retail Displays Feature Machined Aluminium Hardware! Supports are made from machined aluminium, & angle the display for easier viewing! These acrylic retail displays utilise machined aluminium hardware to provide a durable store holder that will last for years to come. The frame is angled upwards to make it easier for potential customers to read the displayed adverts. This hardware requires no tools to be unscrewed either, making graphic changes simple. The acrylic retail displays, also known as poster holders, have been designed to hold A4 (210 x 297mm) standard sized graphics that are in landscape orientation. These units are found in many different locations, including exhibition halls, newsagents, restaurants, cafes, pubs, and information centres. 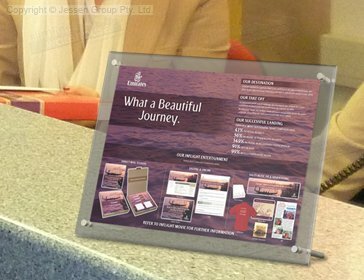 This is a premium quality unit, featuring 3mm thick clear acrylic that makes it easy to read what is being displayed within the frame. 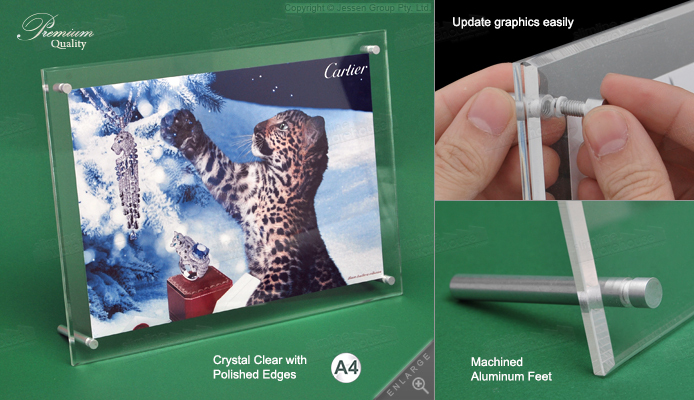 This display has a professional look that resembles glass without the worry of breakage or high-cost! The edges of the frame are beveled & polished to provide a stylish look that will look great in any location! 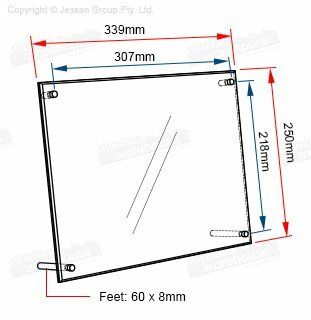 There are different clear display holders to choose from in many different sizes & styles in order to best fit in with the needs of different businesses. Check out all the plastic store stands that we offer to see what is possible at your business! By clicking here, you gain access to all of our products through the online catalogue, with hundreds of items available for you to choose from to outfit your business. Slimline Warehouse has been in business for over 20 years, & we proudly provide same day despatch to anywhere in Australia with items purchased by 1pm EST, including to Sydney, Brisbane, Melbourne, Toowoomba, Hobart, Perth, Darwin, Newcastle, Adelaide, & Gold Coast!